Do you want to join ReturnPath Certification Program ? Then you are at the right place. I will now give you more details about the program. What is the ReturnPath Certificate ? Known as “Bonded Sender” in old days,ReturnPath company has more than 50,000 customers worldwide including ISPs,Universities and many other big companies.It helps determine deliverability for 85% of the mailboxes operated by the world’s top 20 ISPs.Hotmail,Yahoo,Aol,Roadrunner are some of the ISPs joining the certification program.When you join the program,you have chance to email 2 billion email users over your certified ips.The aim of the certification program is to help legal email senders to achieve reaching their customers without any trouble and getting filtered by spam filters.I could definitely help you get certified in the shortest time possible. What is the advantage of getting Certified ? If you get accepted to Certification program,all the emails you send over your certified ips will go to the inbox folder as long as there are no technical problems or you comply with the certification regulations.You will not worry about your emailing program ever again.. Increased deliverability and higher open rates are the main advantages of the program.As to a recent Return Path research,RP customers saw a 15% increase in email open rates for CNET. Return Path has two levels of certification: the Safe List and the Certified List. You get improved deliverability and open rates with both of the certificatin programs. The Safe List: You become a “Safe Sender” when you are accepted into the program. As a Safe Sender,you are known by many spam filters so that your legitimate email is not filtered into junk folders.You are marked as a legal business owner who is following best emailing practices and using configured and authenticated servers.Getting into the Safe List means that you will be treated differently by spam filters like SpamAssassin.SpamAssassin,the most commonly used popular spam filter on the earth,lowers your email’s spam score and accepting you to the inbox folder.Leading ISPs and filtering companies rely on the certification program to identify legitimate and reputable businesses.This means Safe senders experience improved inbox delivery to over 300 million inboxes worldwide. The Certified List: To become a a “Certified Sender”,you should first be accepted into the Certification program and become a “Safe Sender”.If you comply with all of the program standarts such as complain and SRD limits,then you are granted to be a “Certified Sender”.Being in the group of Certified Senders has two main benefits; your links and images in your email bodies will be automatically enabled at Hotmail and Yahoo.You have to own a dedicated ip and 90 days of history to be eligible for Certified List.Do not forget that you have to pass an audit of email practices you have! Your IP addresses don’t regularly appear on blacklists. Become a part of an exclusive network of trust that includes Hotmail and other Microsoft domains, Yahoo! Mail, Comcast, Cox, Time Warner Cable, Road Runner, USA.net, United Online, Rogers, Sympatico, GoDaddy, Mailtrust and hundreds of others. Get the value of getting images and links automatically enabled at Windows Live Mail and Yahoo! Receive preferential treatment by thousands of businesses that use filtering solutions from Spam Assassin and Cloudmark. Receive all the benefits of being a Safe sender. As a member of Return Path Certification, you’ll have access to the largest and broadest email whitelist in the email universe, covering more than 2 billion inboxes worldwide. Plus, you will receive special treatment based on your performance and email reputation giving you the creative freedom to develop campaigns that better connect with your subscriber, extend your brand value and generate higher response rates. The end result is greater ROI on your email program investment. Certified program members gain special privileges at over 2 billion inboxes worldwide. Safe senders experience improved delivery to over 300 million inboxes. This provides program members access to the largest and broadest whitelist in the email universe. No other product or service can match the depth of coverage offered through email certification from Return Path. Certified program members receive preferential treatment at two of the world’s largest ISPs – Hotmail and Yahoo! as well as hundreds of other ISPs and filtering companies. This results in higher inbox delivery rates, which is the foundation of higher response rates. Program members average a 27% lift in overall inbox delivery rates–some get over a 40% lift. Our coverage list also includes GoDaddy, Cox, Comcast, Road Runner, Earthlink, key international domains and hundreds more. With email, what you see may not be what your subscriber gets. For Certified senders, images are enabled at Windows Live Hotmail and Yahoo! so you can focus on optimizing your campaigns for higher response and improved subscriber experiences. ISPs automatically block links to protect subscribers from spam and phishing scams. As part of the network of trust, your email will be delivered with links automatically enabled. This way, you’ll never miss a click! Leading ISPs rely on Return Path’s Certification program to differentiate legitimate businesses from spammers. In fact, hundreds of ISPs currently use our whitelist to make email filtering decisions including Hotmail, Yahoo!, GoDaddy, Cox, Earthlink, Road Runner, Comcast and hundreds more. 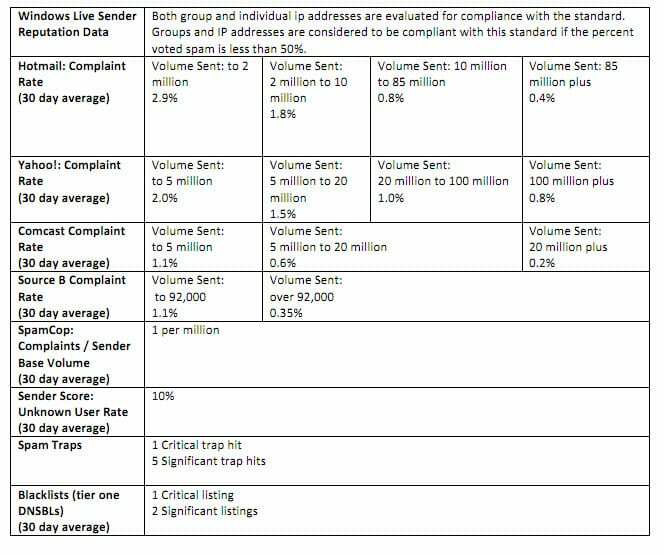 Certified senders will experience improved email delivery at thousands of businesses that use filtering solutions from Spam Assassin and Cloudmark making this an ideal solution for not only B2C marketers but B2B marketers as well. 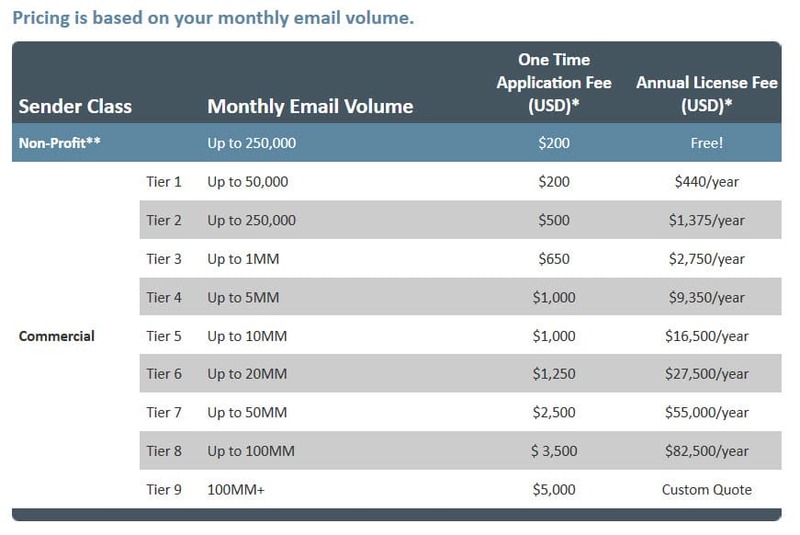 Certified members also benefit from no hourly throttling limits at Hotmail and Yahoo, assuring timely inbox delivery and providing the flexibility responsible email marketers deserve. Certified members benefit from the trusted “unsubscribe” button on the Windows Live Mail interface. This allows subscribers to opt-out instead of reporting a complaint; a situation that could negatively affect your email reputation and disqualify you for email certification. Program members receive a beneficial initial score with SpamAssassin filtering. This enables email senders to use words and phrases that may have traditionally caused their email to be filtered. Because of your trusted status in the program, using words like “Free shipping,” “Lowest Price” or even making “Guarantees” will not impact your deliverability. Now you can focus on creating the optimal offer, survey or newsletter without compromise and with confidence that your message is delivered to the inbox. Return Path Certification provides you with real time notification on the status of your IPs via status alerts. Additional detailed information is available via a web interface and a daily performance report. This way you’ll know which IP addresses are delivering to the inbox and which IP addresses might require remedial action. If for some reason, your IPs have been temporarily disabled or you need help gaining acceptance to the program, Return Path experts are ready to assist. There are no technical adjustments, software installations or other set-up requirements once you qualify. You will simply be added to our whitelist, and the ISPs and filtering companies that rely on our whitelists will query the list and you’ll get the preferential treatment you’ve earned by maintaining a stellar reputation. Depending on the amount of email you send, your CPM (cost per thousand messages) could be as low as six cents, making it a welcome solution for marketers who don’t want to pay a premium just to get delivered. Plus if you are upgraded to Certified, there is no extra charge – just bigger benefits. As a trusted sender in our program, your good reputation is certified. ISPs will get to know you and your mailstreams and have confidence in delivering your mail. If you’ve built a reputation based on trust, you won’t have to pay dearly to benefit from it. Are you interested in getting certified ? Do you have more questions ? Please contact me via here.